Open Your Personal Achille Zibi - Makes Me Come Account! 5.) a concise description of you and your occupation, 6.) a link to your official website or your social network page. You must be 1) a person (not a company), 2) at least 18 years old (if you are under the age of 18, you need your parents' permission), 3) willing and legally entitled to open your personal account at MakesMeCome.com. After your application, the MakesMeCome.com team will open and manage your personal account. 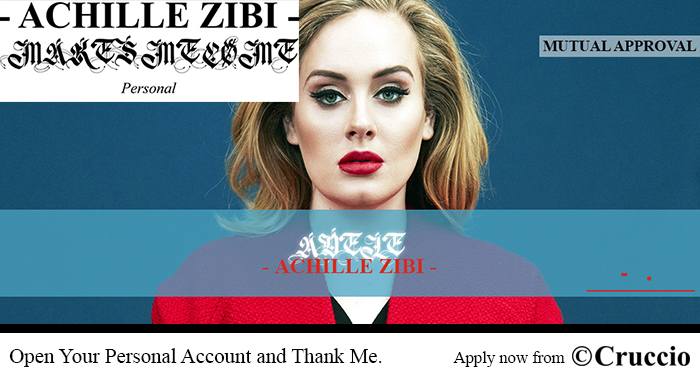 Adele (thanks to whom you opened your personal account at MakesMeCome.com) by Achille Zibi. The remaining 20% (500.- CHF) of the application fee of your Achille Zibi - Makes Me Come Account will be solely administered by Achille Zibi and accounted by ACHILLE ZIBI ENTERPRISE as operating profit. All the details about the payment process of your Bonus (your earnings for inviting people to open their personal accounts at MakesMeCome.com) will be given to you by the MakesMeCome.com team after your application. Your Personal Account at MakesMeCome.com/Accounts, the use of the Internet or this website for communication with the Company or any individual member of the Company, does not establish a celebrity-customer relationship.